As a poker player looking for an exciting live-action online poker game, you may find Three Card Poker by Evolution Gaming quite interesting. This game is played using a single 52 standard playing card deck and offers different types of betting options as well as many possible payout ratios. For the players of Three Card Poker, you have to defeat the dealer to win and you do this by having a hand that comprises of three standard playing cards. Players have to first and foremost place an “Ante Bet” which is then followed up with a “Play Bet” of a similar betting size. A dealer will be eligible for the second round with a “Queen” or a higher valued card. Where the dealer is not eligible for the second round, the player earns the “Play Bet” and their “Ante Bet” will pay even money as well. Players can equally make “6 Card Bonus Side bets” and “Pair Plus bets” if they so desire and this adds to the game’s excitement. As a player of Three Card Poker you will first be required to choose your chip size and then place your bet in the “Ante spot” which is located in the centre of the playing table. You may also place the “Side bets” of “6 Card” and “Pair Plus” if you prefer. As soon as your bet is made, you will be dealt three playing cards that are faced upwards. If the cards you are dealt with are agreeable to you, you can then place a “Play Bet” and the dealer unveils his/her playing cards. Where the dealer has a “Queen” or something higher whomsoever has a stronger hand comes out victorious. However, if the dealer doesn’t have a “Queen” or something higher, you will be declared the winner of the “Ante Bet” and the “Play Bet” is given back to you. 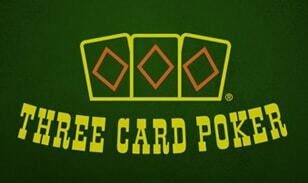 In Three Card Poker the “Ante Bet” as well as the “Play Bet” has a payout ratio of 1:1. The payout ratio for the “6 Card” and “Pair Plus” “Side bets” are higher than the “Ante Bet” and “Play Bet”. Where your hand loses but you have a “Three of a Kind or Better” or “Straight Flush” you will be given the “Ante bonus”. For the “Pair Plus Side bet,” players may receive a payout of as much as 100:1. With a “Three of a Kind or Better”, players can receive a payout ratio of between 7 to 1 and 1,000 to 1. It is important to note that in this poker variant a “Straight” is higher than a “Flush”. This is a thoroughly enjoyable live online poker game that is playable on iOS and Android operating systems on most tablets and smartphone devices. The massive payouts is also a big incentive and poker players would be wise to give this game a try.